Nulon Full Synthetic 5W-50 Racing Oil is recommended for use in V8 (including large bore), 6 and 4 cylinder race and highly modified street engines, where the added protection of a high viscosity oil is required. Group IV Poly Alpha Olefin (PAO) and Group V Alkylated Naphthalene (AN) base oils provide shear stable protection from cold start up to extreme race temperatures. 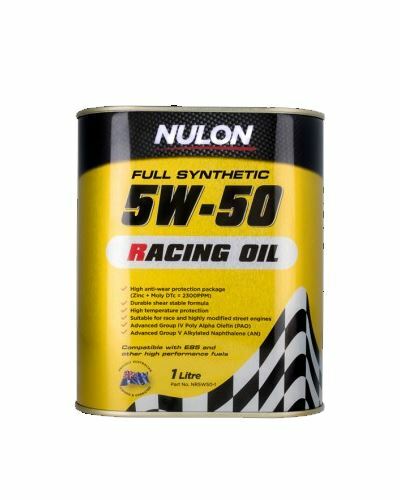 Nulon Full Synthetic 5W-50 Racing Oil provides enhanced protection for vehicles using E85 and other high performance fuels. 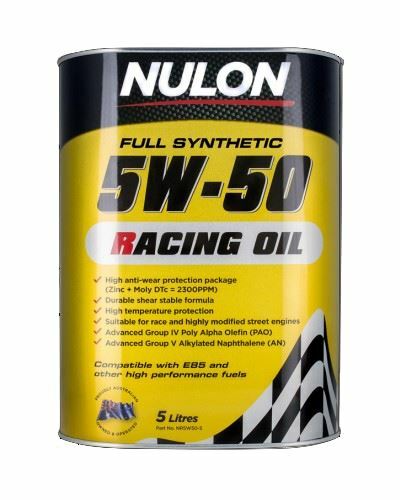 Nulon 5W-50 Racing Oil contains Molybdenum Dithiocarbamate (Moly DTc), which is scientifically proven to dramatically reduce friction, provide increased protection against engine wear and maximise engine power.